Rate this project Rubén Rodríguez Pérez has announced Trisquel GNU/Linux 6.0.1, an upgrade release of the Ubuntu-based distribution that uses strictly free software only (as defined by Free Software Foundation's guidelines): "This is an incremental upgrade release which includes all of the maintenance updates and bugfixes since the publication of Trisquel 6.0. Users that already have 6.0 installed don't need to reinstall. Just use the update manager or apt-get dist-upgrade. The 6.0.1 release comes with several new features and updates: Support for UEFI installation (amd64); Abrowser upgraded to v28, with improved Facebook integration; Linux-libre updated to 3.2.0-60, 3.5 and 3.11 branches available in the repositories; Added open-ath9k-htc firmware to the images; Added all free firmware files to the netinstall images so they can be used over wifi. Trisquel can now be installed on UEFI based computers by disabling the security system in the BIOS setup. We do not sign our kernels or boot managers as that would require us to request permission from Microsoft, something that shouldn't be needed in any case." Here is the release announcement. Download: trisquel_6.0.1_amd64.iso (695MB, MD5, torrent). Trisquel GNU/Linux is an Ubuntu-based desktop distribution which features free and open source software exclusively. The project's latest release, Trisquel 8.0 "Flidas", is based on Ubuntu 16.04 and includes support through to the year 2021. "The biggest internal change to the default edition is the switch from GNOME to MATE 1.12. The main reason for this change was that GNOME dropped support for their legacy desktop, which retained the GNOME 2.x user experience and didn't require 3D composition -- a feature that in many computers would still need non-free software to run at full speed. MATE provides a perfect drop-in replacement, it is very light and stable and it retains all the user experience design that we are used to from previous Trisquel releases. The next most important component is Abrowser 59 (based on Mozilla Firefox), which is not only fully-featured and quite faster than before, it has also been audited and tweaked to maximize the user's privacy without compromising on usability." Additional information can be found in the project's release announcement. Download (pkglist): trisquel_8.0_amd64.iso (2,512MB, MD5, signature, torrent), trisquel-mini_8.0_amd64.iso (940MB, MD5, signature, torrent). The Trisquel project, a distribution which takes a hard stance in providing free and open source software exclusively, has released a new development snapshot: Trisquel GNU/Linux 8.0 alpha. The new alpha carries the code name "Flidas" and switches the default desktop environment from GNOME 2 to MATE. It also features the Linux-Libre 4.4 kernel. "The image has many of the basic components that will be the base for Flidas. The default desktop environment will be MATE 1.12.1, a fork of GNOME 2 that brings back all the functionality and quality level of previous Trisquel releases. The panel, file manager and control centre are already looking polished. This decision comes from the current editions of GNOME requiring 3D acceleration even in fallback mode, a requirement that in many cases forces the user to choose between a degraded user experience and performance, or the usage of non-free graphics drivers. Instead, we aim to provide a fully functional, highly performing desktop for all users." Further details can be found in the project's release announcement. Download: trisquel_8.0_amd64.iso (827MB, MD5, signature, pkglist). Rubén Rodríguez Pérez has announced the release of Trisquel GNU/Linux 7.0, a new version of the Ubuntu-based distribution with focus on software freedom as defined by Free Software Foundation: "Version 7 of the Trisquel GNU/Linux distribution, code-named Belenos after a Celtic sun god, has been released. Belenos is a long-term support release that will be maintained until 2019. Relevant new packages and features include: kernel Linux-libre 3.13 with lowlatency and bfq scheduling by default; custom desktop based on GNOME 3.12 fallback; Abrowser 33 (a free Firefox derivative) as default browser; GNU IceCat 31 available as single-click optional install from Abrowser's homepage, complete with many extra privacy features; Electrum Bitcoin wallet pre-installed; moved to DVD format, now with 50+ languages and extra applications; improved accessibility by default." Here is the brief release announcement. Download: trisquel_7.0_amd64.iso (1,521MB, MD5, torrent, pkglist). 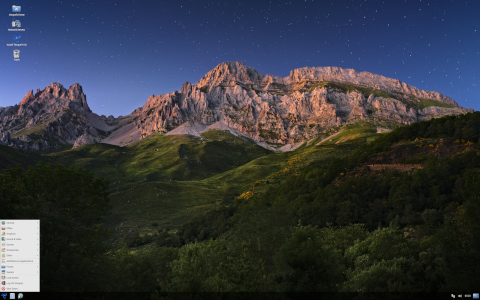 Rubén Rodríguez Pérez has announced the availability of the release candidate for the upcoming Trisquel GNU/Linux 7.0, a new version of the project's Ubuntu-based distribution built strictly from free software components only: "Trisquel 7.0 RC ISO images ready. Included are images for Trisquel, Trisquel 'Mini', and Trisquel 'Sugar' in both 32-bit and 64-bit variants, along with sources and the FSF membership image. This version 7.0, with code name 'Belenos' is based on Ubuntu 'Trusty', and will have support until 2019. Relevant packages and features include: kernel Linux-libre 3.13 with lowlatency and bfq scheduling; custom desktop based on GNOME 3.12 fallback; Abrowser 33 as default browser, with simple Tor integration; GNU IceCat 31 available as single-click optional install from Abrowser's homepage, complete with many extra privacy features; Electrum Bitcoin Wallet preinstalled; moved to DVD format, now with 50+ languages and extra applications; improved accessibility by default." Read the rest of the release announcement for more information. Download: trisquel_7.0_amd64.iso (1,522MB, MD5, torrent, pkglist). Rubén Rodríguez Pérez has announced the release of Trisquel GNU/Linux 6.0, an Ubuntu-based distribution that uses strictly free software only (as defined by Free Software Foundation's guidelines): "This long-awaited release is based on Ubuntu 'Precise', and as usual it comes full of free software goodness. We continue to provide an easy-to-use classic desktop experience complete with full-featured browsing, office, communications and social networking utilities. New features: Linux-Libre 3.2, Abrowser 19, GNOME 3.4, LibreOffice 3.5. Our web browser without a name (Abrowser, a Firefox derivative that does not recommend non-free software) now comes with shiny new features, like full HTML 5 video support (webm, h264 and other formats) that allow to use sites like YouTube without a flash plugin. This version can also show PDF files without a plugin." See the release announcement for further information and a screenshot. Download: trisquel_6.0_amd64.iso (696MB, MD5). Rubén RodrÃ­guez has announced the release of Trisquel GNU/Linux 5.5, a 100% "libre" distribution based on Ubuntu: "Trisquel 5.5 STS 'Brigantia' is finally here. This release is our first to be based on GNOME 3, GTK+ 3 and also Linux-libre 3.0. GNOME 3 was a big challenge, because as it is designed now, it is not usable for our community. The new default interface of GNOME 3 is GNOME Shell, a program that requires 3D acceleration to work, as it relies on graphics composition. Sadly, many graphics cards today still lack a libre driver providing acceleration, so many users who would choose free drivers will be redirected to a fallback desktop environment. This way many users could feel compelled to install non-free drivers to be able to use the new desktop, so we decided to use the fallback environment as default." Here is the full release announcement. Download: trisquel_5.5_i686.iso (696MB, MD5, torrent), trisquel_5.5_amd64.iso (699MB, MD5, torrent). Rubén RodrÃ­guez has announced the release of Trisquel GNU/Linux 5.0, an Ubuntu-based distribution carefully stripped of all non-free components in order to comply with Free Software Foundation's four software freedoms: "In what we can now call it a tradition, we celebrate the Software Freedom Day by publishing our latest release: Trisquel GNU/Linux 5.0 STS, code name 'Dagda'. Today we publish both the standard GNOME-based and the lightweight LXDE-based 'Mini' editions. Current Trisquel 4.5 users can upgrade using the update-manager application, without the need for re-installation. Advanced installations -- server, RAID/LVM, encrypted, etc -- can be done using the 'netinstall' images. The standard edition includes, among many others, the following packages: Linux-libre kernel 2.6.38, GNOME 2.6.32, LibreOffice 3.3.3, Abrowser (our unbranded Mozilla-based web browser) 6.0.2." Here is the full release announcement with several screenshots. Download: trisquel_5.0_i686.iso (676MB, MD5, torrent), trisquel_5.0_amd64.iso (696MB, MD5, torrent), trisquel-mini_5.0_i686.iso (453MB, MD5, torrent), trisquel-mini_5.0_amd64.iso (465MB, MD5, torrent). Rubén Rodríguez Pérez has announced the availability of the first alpha release of Trisquel GNU/Linux 5.0, an Ubuntu-based distribution built strictly from free software components only: "The first development release of Trisquel GNU/Linux 5.0 LTS, code name 'Dagda', is now ready for testing. All the artwork comes from the 4.5 release unmodified, so it qualifies as an alpha release. What's new: based on Ubuntu 11.04, Linux-Libre kernel 2.6.38, GNOME 2.32, Firefox 5.0, LibreOffice 3.3.0. Known bugs: icons in GNOME tray have no fixed size; the default manual in yelp is the Ubuntu user guide; Exaile doesn't come pre-configured; the recovery menu lets you log in as root with no password." The brief release announcement has information about the bug reporting procedure. Interested alpha testers can download the live CD images from here: trisquel_5.0-20110720_i686.iso (682MB, MD5), trisquel_5.0-20110720_amd64.iso (701MB, MD5).